The 5K Zombie Run was insanely fun. Like when I got home I immediately looked for another one to sign up for fun. There weren’t nearly as many people there as I expected, maybe because it was the weekend before Christmas. Maybe because it was the day after the world was supposed to end so people wanted to spend their hard earned money on something they knew they’d actually get to enjoy. Either way it worked for us; there was no line to speak of for anything but still plenty of runners and zombies to make it fun! This race was at the Little Everglade Ranch just like Pretty Muddy, but it was a completely different route. I love that place! The race didn’t have a whole lot of obstacles, most of them where haystack mountains and over/unders. Oh yeah, and the zombies. Basically when you see the zombies ahead everyone tried to get in a group and then sprint past them in different directions, theory being that they couldn’t get everyone. It was a whole lot like a grade school playground game of tag with different random groups of strangers on your team at any given time. I made it about 2 thirds through before dying, I have to admit that’s further than I thought I’d get. 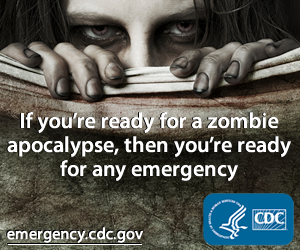 These were not the slow zombies of the original Dawn of the Dead! The best part of the race was the barn. I was already dead anyways but some of us recently infected were running decoy for the still living. A bunch of people were grouped together before the opening to the barn, you could see tons of zombies silhouetted in there and there was one in a suit crawling slowly towards everyone, dragging himself on his elbows. That guy jumped up so quick I didn’t even see him do it, he was just suddenly sprinting towards everyone, and all of the runners scattered through the barn in a panic, you would have thought we were really in a life threatening situation. The other best part is that although my hip did start aching it didn’t start for quite a while and didn’t get too bad. I think the trick is going to be to stop running on concrete and maybe try trail running, the concrete seems to kill my hip in just a few steps. Oh, and the other other best part was the zombie truck. I wanted to be a zombie just so I could go for a ride on the truck! So, I did the barefoot run, and it did not go so well. My hip started hurting just a few steps in. Not near as bad as it was before, but still extremely discouraging and depressing. I finished the run anyways, it wasn’t very far. I can finally start running again in two days, Saturday. Considering the sad fact that the longest I’ve ever run was 3.5 miles and really just 3 miles on my long runs about killed me I figure I’m pretty much starting from scratch again. Which I’m actually OK with, that just means that every step is an improvement over today. And it means I can try something new without worrying about backtracking. I’ve been reading lots about getting started running barefoot, and just like ever other subject the information out there varies from several web sites content being word for word the same (I always wonder where on earth the original content comes from when this happens) to totally contradicting information. A lot of sites recommend starting with just 200 feet per run the first week. That sounded great until I looked it up and found there are 5280 feet in a mile. So they are saying I can run down the driveway and be done? I understand that you are supposed to start easy but geez, I’d like to actually start. So I pulled up Mapmyrun.com to see just how far 200 feet is, and just how far a quarter mile is since that’s what I intend to start off with, and I want to see what the difference is. It doesn’t show feet so I still insist I’d be done with 200 feet before I left my yard. But it does show a quarter of a mile is about to my parents house, which is about that far up my street. So there you go, I have my first goal. A quarter mile barefoot run Saturday, and if I feel great I’ll do it again on Sunday. I have my Fila minimal shoes I’ll have to wear on weeknights I run, I’m not home when it’s light out on weekdays (thank you, daylight savings time) and I’m not risking stepping on a snake/frog/giant beetle/whatever in the dark. I think this will be great fun. I go everywhere I can barefoot now, and if I have to wear shoes it’s pretty much always sandals so the only worry I have is my stupid hip. Oh and the fact that my sister says I’ll get worms if I run outside barefoot, my coworker says my knees will be useless within 5 years, and my mom just thinks it’s gross. Lucky I’m used to it, if people I know started telling me now that my super-great ideas are super-great at this point I’d be very suspicious. When will they learn??? It seems I took the Dr.’s order to take if easy for two weeks perhaps a bit too seriously. I have done NOTHING so far but eat crap. No running, no walking the mutt (she pulls so hard it was bothering my hip to walk her), no stairs at work. I watched the entire first season of American Horror Story and have an awesome place in Minecraft though, so that’s something. I got a bunch of stuff done around the house this week, so it wasn’t as much of a total wash as it feels like. But I can’t believe how easy it becomes to do nothing that is good for you. I haven’t even done yoga until yesterday; I used to do yoga daily. That’s a habit I’m getting back into starting yesterday! Yoga is every bit as good for you as running both physically and mentally, but in a completely different way. The two complement each other perfectly. Time to get back to 20 minutes of yoga on work days and 40-60 on days off. Goodness knows I need something to help keep me zen, I don’t stay that way naturally! This is the first time I participated in Lindsay’s Foodie Pen Pals. I had fun looking for locally made items and even found some things I’m going to have to buy to try myself. My package was sent by Shanon in Detroit. Thanks Shanon! 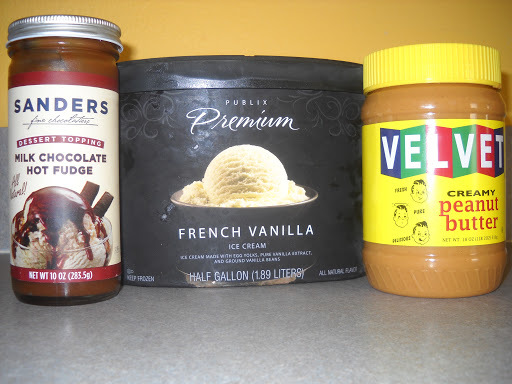 She included a jar of Velvet Peanut Butter and a jar of Sander’s Hot Fudge so of course I went straight out to buy a gallon of vanilla ice cream and we spooned a bit of peanut butter and fudge over the ice cream to try it. My kids thought it was funny that I put peanut butter on their ice cream but we all agreed it was an awesome combination! She also sent an assortment of Faygo soda which is was bottled in Detroit. I haven’t tried them yet but will! I rarely buy soda so my kids are kind of drooling over it, I’m not sure I’m going to get any of that. For December Lindsay is doing something a little bit different, instead of arranging for everyone to send and receive food packages she’s asking that her group of pen pals send the money they would have used for the food boxes to help those affected by Hurricane Sandy. Her goal is to raise $1500, if you are interested in helping out please go to her site to read about it and sign up!